The Hyosung GT250R has been updated for 2013 and is probably one of the first competitive non-Japanese 250cc to hit the world wide market and maintained a good reputation for reliability and affordability over a relatively short period of time on the market. Sure its not regarded as a premium brand but it does offer a valid additional choice in what is a small market here at least. Looking though the specifications there no significant differences in the updated 2013 model to prior series apart from more black plaint, modified instrument box and different colour schemes and fairing design. Indeed in the showroom there is very difference between old on update GT250R in build quality or design. Although the differences are small they make the GT look better. I haven’t had a chance to ride one yet so opinions on that side of things will have to wait. 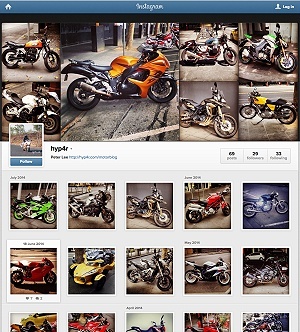 So why would you buy the new Hyosung GT250R over any other 250cc or learn and commuter class motorcycle? )Apart from the promise of an all new model being made ready for 2014!) I think the GT250R’s selling features are the just right physical size, good looks, V-Twin sound track USD front forks and class competitive power and at a reasonable price. Of course the only downside is the 5 speed gear box which is an interesting aberration for any motorcycle in 2013. 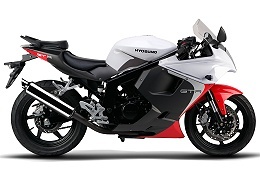 Overall the Hyosung GT250R is another great little motorcycle that is very well specified. The only shortfall is the gearbox but otherwise there’s very little else that has the same level of features. Unfortunately and like the other manufacturers of 250cc motorcycles it is no longer priced as enticingly as it should be considering the high Aussie dollar.